Greetings! My name is David Lundin, Jr. and I was a contributing writer for Retrogaming Times Monthly from 2004 - 2013. After Retrogaming Times Monthly ceased publication in early 2014 it seemed that everyone attached to the newsletter went off to different projects, some together and some independently. Occasionally some talk would come up about "getting the band back together" but nothing would ultimately come of it. In January of 2016 I began a serious focus to relaunch the newsletter as I missed not only contributing to it but reading others thoughts, stories, and memories concerning retrogaming. I made a posting on the old Retrogaming Times Monthly Yahoo Group, essentially stating that I was ready to go if people were interested and would allow me to carry the torch. Response was surprisingly positive and I was contacted by Rob Luther of The Retro Junkies, the final publisher of RTM, with the approval to revive the newsletter. I also received the go-ahead from Bryan Roppolo, who was not only RTM's outgoing Chief Editor and webmaster but also the person who kept RTM going for much of its most prosperous years. With the consent of the captains of Retrogaming Times Monthly, I continued forward and stepped up as Chief Editor to revive this decidedly old school online endeavor. With all that said it is my humble pleasure to officially introduce "The Retrogaming Times." The core idea of The Retrogaming Times is to bring back the simplicity of the middle days of the previous newsletters and make the articles the star attraction. We will be publishing bimonthly, that is a new issue every other month, to be published on the 1st day of each odd month (March, May, July, September, November...) This decision was made to facilitate a more flexible submission window for anyone who desires to contribute. If there is one thing I want to champion above all else it is that The Retrogaming Times is 100% free and 100% driven by retrogaming hobbyists, such as yourself, who submit articles as contributing writers. True to the spirit of Tom Zjaba's original "Retrogaming Times," anyone is welcome to submit an article for publication. Other hobbyists want to read what you have to write and we are always accepting submissions for future issues of The Retrogaming Times. Join a great retrogaming tradition, submit an article today! Well, after you read this issue that is. A huge and heartfelt thank you to all RT and RTM staff, everyone who has ever submitted an article to either newsletter, anyone who has ever read any of the previous newsletters in part or whole, all those who have come along with me to this new enterprise (showing me that ol' InsaneDavid really isn't all that crazy) and of course to anyone and everyone who is reading this today. Read on, we've got a good one for you! California Extreme is very pleased to officially announce the dates for this year's California Extreme Arcade and Pinball Show. It will be held on July 16-17, 2016 at the same fantastic location - the Hyatt Regency in Santa Clara, California. Please join us for our 20th show with hundreds of your favorite arcade and pinball games, both past and present, all gathered together for another fun-filled weekend of pure arcade excitement for folks of all ages! California Extreme is working on this year's lineup of seminars, guest speakers, and other arcade-themed events that make the show so much fun each year. On that note, we are looking to you, the arcade community, for suggestions for topics and speakers. Is there something you would like to see presented (or even to present yourself)? This is your chance to let us know what you would like to see! Send us an e-mail at info@caextreme.org and let us know. We welcome all suggestions and will consider each one carefully. KansasFest 2016, the 28th annual Apple II convention, is scheduled for July 19 - 24 in Kansas City, Missouri. Mike Harvey, a business executive, salesperson, technologist, project manager, entrepreneur, programmer, and best known in the Apple community as the founder and publisher of Nibble magazine, will join us with a keynote presentation. KansasFest is an annual convention offering Apple II users and retrocomputing enthusiasts the opportunity to engage in beginner and technical sessions, programming contests, exhibition halls, game tournaments, and camaraderie. Any and all Apple II users, fans, and friends are invited to attend this year's event. Please visit the event's official Web site. If there is a show or event you would like listed here, free of charge, please contact David directly at trt@classicplastic.net. Please include a short official blurb about your event along with any relevant links or contact information and it will be published in the next issue of The Retrogaming Times. As some of you might remember, I was the editor/web master of Retrogaming Times Monthly about 1.5 years ago. Running that publication was very time consuming and was starting to become a huge burden, which was the reason for allowing the Retro Junkies to take over the magazine. Now, however, Retrogaming Times has been reborn as The Retrogaming Times and I wish it a successful and prosperous future. When I got the call from David Lundin, Jr. that he was getting the old gang back together again, I couldn't help but want to become part of the magazine's revival. 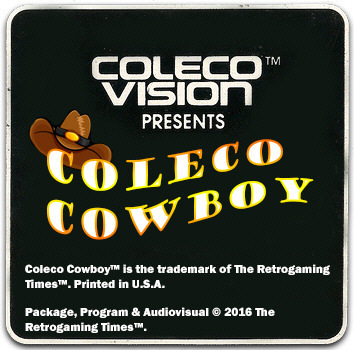 Therefore, I decided to start a regular column called Coleco Cowboy where I chronicle my rounding up of Colecovision items. When I first got into collecting classic video games, I started with the TI-99/4A Home Computer. This was a computer that I had growing up, and actually have a picture of me getting one in Christmas of 1983. I have always kept my TI-99/4A around and would dig It out from time to time to play old games and find some new ones. When I got seriously into collecting in 1997, and found the Internet groups of people collecting for old systems (anyone remember rec.games.video.classic? ), I started hunting down games left and right, even uncovering prototypes of unreleased games. In that time there was always one other system that caught my fancy, that being the Colecovision. 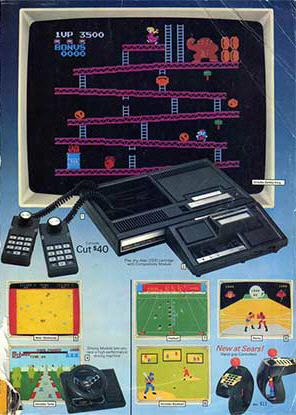 I would see screenshots of games for the system (Michael J. Novak, Jr's website Video Game Advantage was awesome in that regard), and could not help but want to have a Colecovision for myself. However, I was completely loyal to the TI-99/4A at the time and wanted to uncover as many unreleased games as I could. Having another system would have only cut into that time for TI hunting. Eventually though, things started to dry up and I kind of got out of the collecting aspect. That is, until a few months ago. Starting around September 2015, I decided to take the plunge and get a Colecovision and build a complete-in-box collection for all known released US games and peripherals. So far I have been pretty successful in building my, as of now, small collection of CIB items, and am pretty happy with what I have been able to accomplish in such a short time. With this new endeavor and the revival of Retrogaming Times, it only was natural to start this column. The name of the column comes from the fact that I was a TI (Texas Instruments) guy that has now started a Colecovision collection. Hence, Coleco Cowboy. In this space of The Retrogaming Times, I plan to not just review items that I have acquired, but also provide a background story on how I managed to score a particular item, any interesting stories behind it, as well any setbacks/pitfalls. To put it simply, this column will cover all facets of Colecovision collecting from someone just getting into the system, as well as provide some feedback on to what I liked/disliked about each particular cartridge/peripheral I come across. That was it, all this waiting for nothing but a black screen. 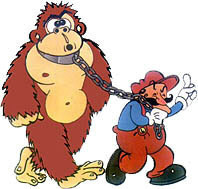 I tried reseating the Donkey Kong cartridge, but to no avail, nothing would pop on my TV set. I then took to eBay and looked around and that's when I discovered, to my horror, that Colecovisions were known to not work very well. I was dismayed. All these years (decades?) of wanting a Colecovision, and the moment arrived where I had my hands on the real thing, and yet I could not play anything on it. It was almost as if it was just not meant to be. Later that night, I wound up on AtariAge and decided to post a message there asking if anyone had a WORKING Colecovision unit to sell. I mean, even though I spent $82 on a non-functional unit, I was not to be denied. Anyway, I at least came out of it with a pristine box with original cables and documentation. So not all was lost. Shortly after the post was made I received a reply from a guy that goes by "Mumbai" who said he could help me out. He actually mentioned that he would buy broken units for about $25 and it would take a few broken ones to basically make a working one. I offered him $70 for a working one, but he countered and said $60 including shipping! I was astounded that someone in the classic gaming community could be so helpful to someone just starting out with the Colecovision. Mumbai did not need to do that, he could have taken the $70 + shipping, but instead offered a console to me for something like $50 once shipping was taken out of the equation. What an awesome guy, definitely one to deal with if you are into, or want to get into, the Colecovision world. He has a big collection that he will be selling eventually, so I'll be looking out for that, as should others. Upon arrival of this working unit, I plugged it into my TV and voila, I had entered the Coleco universe. My vision would never be the same again, I now was experiencing Colecovision! Forget 20/20 vision, it's all about that Colecovision. Since the only game I had at the time was Donkey Kong, I plugged it in and was enamored by how good of an arcade conversion it was! Donkey Kong himself moved, the sound effects were awesome, and the gameplay good. The only drawback was that my hands started to hurt after just a few minutes of gameplay. I was indeed, not used to using these Colecovision controllers. I can now see why people said their hands would become sore after playing. It's not because they are playing so intensely, it has more to do with the design of the controllers themselves. Now it was my turn to feel their pain. Welcome back readers! Its been several years since Retrogaming Times Monthly ceased publication. I personally made a last ditch effort to revive RTM but the efforts seemed to be in vain. After publishing for many years and having several incarnations, I thought it was time to put RTM to bed. With the end of RTM and lots of things going on in my life, I have not been an active participant in the Retrogaming scene in recent years. I do still following what's going on in the Apple II world by reading the A2-Central site (http://www.a2central.com) and reading the comp.sys.apple2 newsgroup. I had planned to write something more substantial for this month's debut issue. Alas, the best laid plans got changed. For now, I will just say that I will definitely be writing for the magazine again. 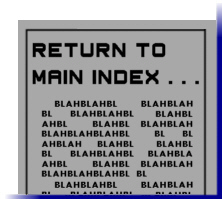 I will likely focus on the Apple II but as I did in years past, I may revive my columns on other systems such as the Atari 5200 or Vectrex. Hope everyone is having a good time and welcome back! Using the simple collectible trading card as a vehicle, the Walter Day Collection documents and commemorates the history of today's popular culture, focusing on science fiction, comic books, the video game & pinball industry, and the remarkable emergence of professional eSports. You can register on the website to join forums, add pictures from community events, and comment on anything and everything about the video game industry. Each week there is a new Trading Card Spotlight that highlights a particular person on a card and some of their opinions on the video game and pinball world. Articles form Walter Day himself can be found as well on the website. Walter is hands on and ready to answer any questions you may have as well as suggestions for new cards and events. Coming soon is the Walter Day Collection Store. Here you can purchase copies of these trading cards as well as other items from the history of Twin Galaxies and events Walter attended in the past. The collection was founded by Walter Day, of Fairfield, Iowa. Walter was the co-founder of Twin Galaxies and the author of numerous world record books. Over the last 35 years, Day originated numerous research projects that used business cards, high school yearbooks, and vintage newspapers to study history. The card set was a long time in the making. It got its first inspiration when the January, 1983 edition of LIFE magazine published baseball-card-sized photos of the champion video gamers of that time posing with their favorite games. Taking LIFE magazine as a cue, Walter Day (working under the Twin Galaxies banner) began to ask gamers in the summer of 1983 for photos and bios that could be put on trading cards. Though prohibitive printing costs derailed the project, Day didn't give up and tried again in 1985 when he produced a plan for a 110-card trading card set that featured the top players and the games they conquered. However, once again, the printing costs were insurmountable. 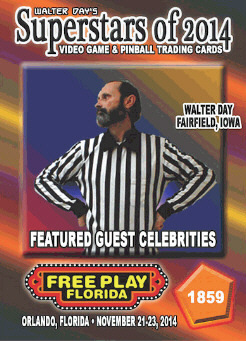 Fast forward to 2008 - Walter Day asked Caroline Hoose and Greg Hoose (The Greye Ghoose), of Fairfield, Iowa, to create prototype designs for a trading card set for Twin Galaxies. Those designs would eventually be used as promotional items handed out at The Big Bang (2009) - the celebration in Ottumwa, Iowa, that saw the launching of the International Video Game Hall of Fame. By February of 2011, the designs created by Greg Hoose would become the Twin Galaxies Video Game Trading Card Set - a set originally created to celebrate Twin Galaxies’ 30th Anniversary in 2011. More recently the collection has branched out into the science fiction and comic industries with cards planned for classic sci-fi authors and legendary comic book artists. Plus, an additional series of cards focuses on Fairfield, Iowa's unique distinction as "The Renaissance Capital of the World." 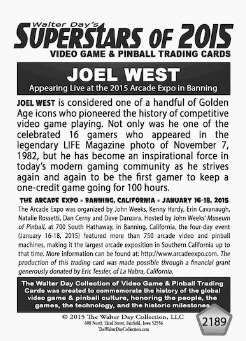 On February 14, 2014, ownership of the Twin Galaxies Video Game Trading Card Set was transferred over to Walter Day. 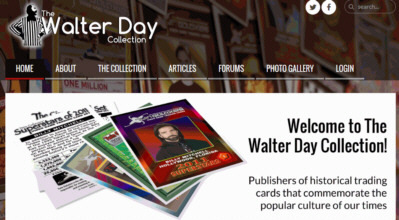 Now called The Walter Day Collection, Day says this of the collection: "I plan on seeing the card sets we publish becoming leading exponents of video game, comic book, and science fiction history. I hope you are all behind us as we have a lot of work to do." The website is the product of the creative genius of Brian A. Peat and Derek Sorrells. We have them to thank for contributing their great website to this project. We have to thank Eric Tessler, of La Habra, California, who, as a gift, has sponsored the printing of more than 500 cards as well as covering the organizational costs for more than one dozen Awards Ceremonies. Also, we thank Mark Hoff and Jim Schelberg for skillfully writing and designing countless cards for the Walter Day Collection. Todd Friedman and Michelle Ireland are writers for the website and Joel West is in charge of the web store and the items that are being sold. Walter recently retired from Twin Galaxies to pursue a career in music but continues to appear at events from time to time. He also loves making trading cards. I'll never forget the day I met William Culver -- before I knew him as Willie, or the evil Shredwillier from Turtle Flakes, or Willigor, or Darth Willie, or even the Jockster from The Retro Junkies Super Show. It was RetroMania in Canton, North Carolina in the winter of 2014. RetroMania was a classic arcade tournament at a local store aptly called The Retro Gamer, which was organized to help a local charity in my friend Landon's hometown. It was a great time. Dozens of locals came by to support the cause and showcase their skills with classics like Ms. Pac-Man, Galaga, Frogger, Dig Dug, Donkey Kong, and dozens more. I was one of the score keepers on that brisk January morning, and it was a blast seeing people rally together to set high scores left and right. Then, like Clint Eastwood entering an old saloon, in comes William Culver. I had only known Willie for a few weeks prior to RetroMania, as we met like so many others in the retro gaming community through podcasts, but I was already a huge fan of his work. While I can't remember who initiated contact first, I do remember watching Willie's Arcade USA YouTube channel very early on. I loved his show! Watching Arcade USA was like stepping into a time machine and traveling right back to the golden age of arcade games and neon lights. With reviews of classic games, modding tips, pickup videos, arcade tours and interviews of arcade owners around the United States, I couldn't get enough. Back to RetroMania. In comes the man they call Willie. Only, instead of carrying the patented Eastwood revolver, he's carrying a box full of retro memorabilia -- a bunch of shirts, hats, stickers, and posters he was donating to help the charity. That's when I knew Willie was a good guy. The kind of guy you admire in the retro gaming community. And to expound on his character even further that day, he brought issues of RETRO Magazine, which I had heard great things about, but hadn't had the chance to read at that point in time. However, Willie never once mentioned that he actually wrote articles for RETRO. He simply promoted the magazine by talking about the great articles that were written by other writers. It wasn't until I bought the inaugural issue of RETRO Magazine and started reading it a day later when I saw a little column called Arcade USA, written by -- you guessed it -- Mr. Culver himself. That's the kind of guy he is. Not to mention, he set the high score for Donkey Kong and set the second highest score for Galaga in one day. Not too shabby. In the two years that I have known Willie since RetroMania, I have come to realize that he is one of the most giving and caring people I've ever met. He's randomly sent me Ninja Turtles toys and classic games in the mail. He's beaten me to a copy of a boxed Castlevania II only to tease me and give me the game afterward, he's started several Retro Junk boxes in the Retro Junkies Network, he's designed a variety of logos and recorded bumpers for fellow podcasters, and if you watch or listen to any of his shows, he's always the first one to promote someone else. He's even come by to hang out and play games with me a time or two -- the last one being particularly memorable with a night full of bratwursts, Mountain Dew, and Vectrex gaming! My point is this -- Willie is a regular guy who simply loves gaming, having fun, and being kind to others. As Willie fondly states in the following interview, Gamester81 inspired him by his many acts of kindness. Well, Willie inspires me the same way. William Culver is indeed a retro gaming hero, and I'm proud to call him a friend. Can you tell us about your retro gaming podcasts and YouTube shows? My main focus is Classic Arcade Gaming, but I do dabble in other retro gaming areas -- mainly pre-crash consoles, as they were what I grew up with. Around 1983, when the videogame crash was starting, I had just received my driver's license and got into hot rods and chasing skirts :P. I really did not come back until after I met my wife and we purchased a Sega Genesis on launch day and played Altered Beast all night. I do some podcasts with some really great friends such as Vectrex Radio with my pal Indiesoul, Atari 5200 Super Podcast with Arkay and Cap'n Bob, ColecoVisions Podcast with Gamester81 and the Channel F Files. I also do an "adult" themed podcast called IntAriVisions with my very good friends Ferg (2600 GBGP), Rick, and Paul (Intellivisionaries). I do beta testing for new Colecovision games coming out from Collectorvision, thanks to Gamester81! Also, I am trying to set up a yearly charity event for my Arcade USA show at a local arcade. Do you have any personal heroes in the gaming community? Yes, I do. I would have to say the person I respect the most would be Gamester81. Of all the gaming personalities I have met, he was the friendliest, most down-to-earth person. While most seem to have a case of being "internet famous," Gamester has always been friendly and offers great advice and is never judgmental. He has become a very good friend and recently asked me to join his site Gamester81.com to submit articles and such! At the Game On Expo this past year in Mesa, AZ, I saw Gamester81 do something that totally describes the person he is. A young boy was desperately trying to find Gamester81, to meet his hero. Gamester was passing by and did not hear the boy (the look on his face after not being heard was awful) until I called at him. Gamester turned and saw the boy looking at him and came over. He kneeled down and talked with him, which elated the boy to no end -- I'd never seen a child smile so big! Gamester was extremely busy at that show, as he was running it and trying to keep everything moving. He took the time to stop and talk to this child and put everything else aside. That, right there, is class! That's how I want to be in the community, as well. What inspired you to contribute to the retro gaming community? I used to be very active on the USENET groups long ago. I also was a Sysop of a BBS and a Co Sysop of another. I wanted to get back into the "community" feeling again to share my passion for gaming. Podcasting was inspired by my good friend Jeremy, who did Stalking the Retro. He convinced me one day to come on a podcast with him -- he still has the first recording which is quite comical, as I was a nervous wreck. But his persistence got me to come on more often, and I soon enjoyed it. Once Ferg started up the 2600 Game by Game Podcast, and then my good friends Paul, Rick and Will started Intellivisionaries, I decided I wanted to do a podcast of my own. Jeremy was instrumental in getting me started up, for which I am very grateful to have a friend like him. 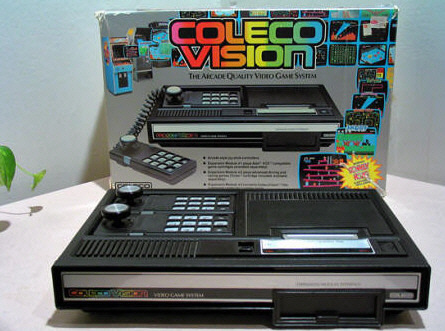 My other good friend, SocalMike, and I were talking one day, and we both started talking about our love for Coleco and ColecoVision, so that's when it was decided to start up the ColecoVisions podcast. We are in our second year now and there have been some changes, but it seems to be still going well and has been well received. The Atari 5200 Super Podcast was inspired by a listener of ColecoVisions, ArKay!. ArKay contacted me and we began to talk. We seemed to form a friendship rather quickly. He wanted to get into podcasting and talk about the 5200. From there, it evolved to the podcast we do now together. The Channel F Files came about due to it being my first owned system; I have lots of experience with the system and wanted to share my love for it with others. Now for IntAriVisions, that show came about after Ferg, Paul and I were on Skype drinking. We started talking about ports of a game on our systems, and it was quite hilarious. I don't know whose idea it was to make a podcast out of it, but it happened, and it is very popular. 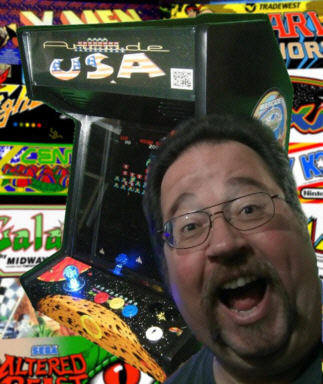 Finally, my YouTube show, Arcade USA, came about mainly to help me overcome my shyness. Getting in front of a camera to interview people and do overviews of arcades helped bring me out of my shell. Thanks to Arcade USA, I am more at ease speaking in front of groups and am not as shy as I once was. Where did your passion for gaming begin? My father brought home a Tournament 2000 Pong system that also included a light gun. I was very curious about it and marveled how I could control objects on the TV screen. Being 10 at the time, I was already into electronics (my father used to take me on service calls with him and also fix TVs and such in his workshop) so it was not very long before I had opened up the system to see how it worked. I even went as far to change up how the games played -- smaller paddles, faster targets, etc.. That system started me down the road of electronic gaming, which is still a major passion of mine today. Can you recall your first gaming experience? Well, for non-electronic games, I remember getting a Toss Across. It was tic-tac-toe game, but you had to throw bean bags to spin the targets to say X or O. I loved that game, many fond memories playing it! For an electronic game, I received for Christmas in my stocking was a Mattel Auto Race game. I played it a lot, and I mean A LOT! What is your favorite console? Console game? What's one interesting or funny fact about you that makes you unique? I have a knack for making people laugh. I think the best thing you can do for someone is to make them laugh. Be it at my expense, if it causes someone to laugh and be happy, I tend to do it. I am a very caring person. What does retro gaming mean to you on a personal level? Retro gaming reminds me of all the good times I had with my family and friends growing up. It also provides me with a feeling of community with my new friends I have made along the way. I sometimes tend to be over generous, but that has always been my nature. If you could describe gaming in one word, what would it be? How can readers find all your work? 2010 mainly due to the story of cooperation between to bitter rivals to get to Jupiter and investigate what happened to the Discovery and Bowman. The book I think is better than the film, but the film is quite good on its own. Other hobbies aside from retro gaming? Model Railroading, Electronics, Robotics, Photography and my Pug Snarfle! Retro Gaming Heroes is a bimonthly column dedicated to classic video game writers, podcasters, YouTubers, world record holders, and overall ambassadors in the retro gaming community. Rob Luther has been writing for The Retrogaming Times since 2012. He is also the cofounder of The Retro Junkies Network, a family friendly podcast and YouTube video network dedicated to all things retro. In addition, Rob is a cohost of The Retro Junkies, Turtle Flakes, and Genesis Gems podcasts. Outside of the gaming realm, he is a proud husband and father who enjoys teaching, reading, writing, hockey, guitar, and all things Teenage Mutant Ninja Turtles. His email is rob2586@comcast.net, and you can follow him on Twitter @rob2586. Thank you for reading. Good day and good gaming! 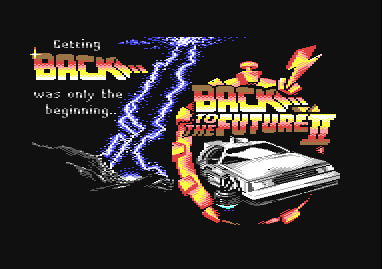 The Back To The Future trilogy is loved by film fans, and it spawned a trilogy of tie-in games for the Commodore 64. Some famous names were involved in bringing the action to the small screen, so let's fire up the flux capacitor and accelerate to 88 words per minute to look back at the games. Electric Dreams was a label formed by Activision in the UK, attracting some top talent and creating some interesting games. Film tie-in Aliens was a hit, using a first-person perspective. Big Trouble In Little China flopped. 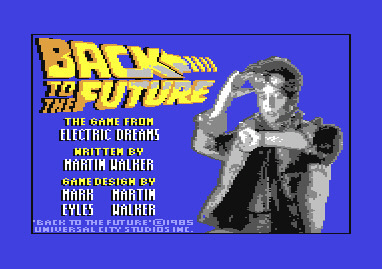 Martin Walker was a rising star and created the original title Chameleon for Electric Dreams, a clever mix of arcade action and elemental puzzles. But his first task for the label was a rapid development job, to create the tie-in to Back To The Future. Marty has to roam Hill Valley and make sure his parents fall in love, while avoiding the bully Biff and helping Doc Brown. The objects found around the town and locations (entered by pushing up at the doorways) include a guitar, a cup of coffee and the radiation suit. If Lorraine and George are apart, the photos of Marty and the family start to disappear. Keep the two together and the pictures fill in again. Sadly the poor graphics and tricky controls let down the interesting ideas. With more time and testing perhaps this could have been worthy of the film. 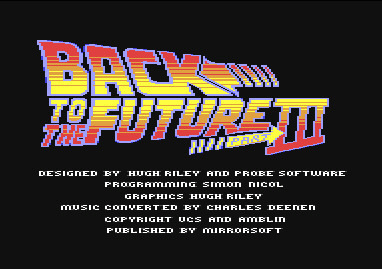 Mirrorsoft paid handsomely for the rights to the sequel, and created a multi-part game reminiscent of Ocean's great tie-ins. There were five distinct levels telling the multiple twists of Marty's journey into the future and the past to foil Biff Tannen and stop him changing the future with the sports almanac. 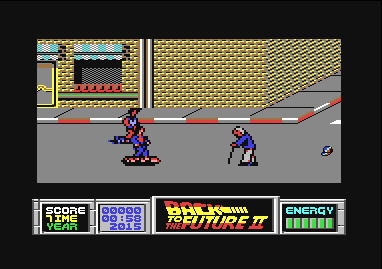 Level 1 has Marty on his hover board, escaping from Griff's gang to meet Jennifer at the 80s Cafe. He can grab onto passing cars to move faster, but must jump over obstacles and pick up icons for extra energy. Level 2 sees Jennifer trying to escape from her future home without meeting her future self. This logic puzzle is shown from overhead with people moving from room to room. Level 3 is set in the bad 1980s, with Marty fighting the street gang in the back alleys. Level 4 sees him back at the Enchantment Under The Sea dance. This is a sliding puzzle, with the pieces animating as the player shuffles the mixed up pieces back into the right places. Finally comes a skateboarding level set in 1955 which plays in a similar way to the first level. All in all this is a mixed bag of ideas and implementation. There is a nicely presented intro (showing the DeLorean taking off) and good music from David Whittaker. But the board levels have very blocky graphics and the beat 'em up action on level 3 is terrible. The two puzzle games are better, especially the animated sliding puzzle. While it is better than the first game it still feels a little shabby around the edges. The third and final film was a jolly tale of the Wild West, and it inspired the best tie-in of the series. Probe's team was up to the task. Simon Nicol was most famous for Crazy Comets and Mega Apocalypse, inspired by arcade hit Mad Planets. 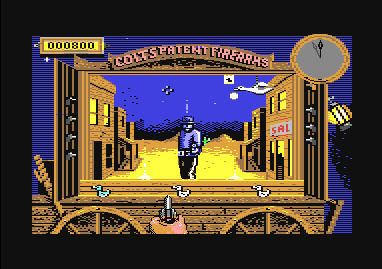 Hugh Riley's pixels had graced games including The Last Ninja. And Jeroen Tel was one of the Maniacs of Noise, responsible for classic demo and game music. This time the action is split into four levels, with each preceded and followed by nicely drawn cutscene pictures telling the story. A great animated intro and title screen complete with the famous theme music kick things off in style. 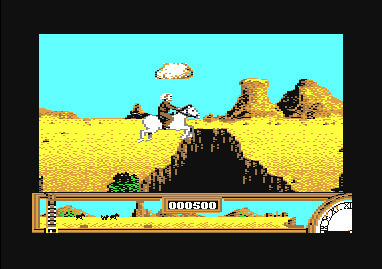 Level 1 sees Doc Brown on horseback chasing the runaway buckboard before it goes over the cliffs. 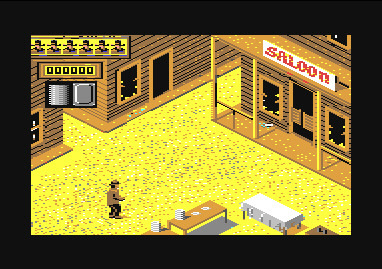 The action switches between a horizontally scrolling view (where Doc must jump obstacles and dodge the luggage falling off the buckboard) and a vertically scrolling view (where Indians shoot at him in the narrow canyons). Catch the coach in time and it's on to level 2, the shooting gallery. Shown in first-person, there are big gunmen and small targets to hit and lots of hidden bonuses to find. Scoring enough points earns Marty the gun, but he does not need it on level 3. Here he is armed with pie dishes and can pick up more from the table. He must fling the dishes to knock out the bad guys before his makeshift bulletproof vest is too badly damaged. 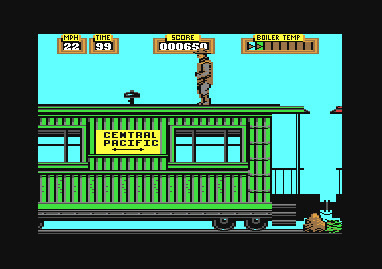 The final level sees Marty jumping from coach to coach on the steam train, dodging the trackside poles and flinging more pie dishes at the bad guys. He must also pick up the special logs to raise the boiler temperature, before dodging the steam from the boiler to reach the front of the train. When it hits 88 mph it can accelerate the DeLorean and send Marty back to the future. The combination of great graphics, great presentation and variety in the gameplay makes this the best of the three games. Music and sound work well and there is a real challenge to get through all four levels. There is also a rare double pack compilation of parts 2 and 3 for collectors to track down, with its double-sided box. I hope you enjoyed this look back at the classic film franchise. In my parting column for Retrogaming Times Monthly, back in December 2013, we finally finished up taking a look at the ten cartridges that were released for the Tomy Tutor in the United States. As it is with many video game systems originally released in Japan, there were more than a few games that never left the Land of the Rising Sun. The Tomy Pyuuta, as the Tutor was known in the East, was home to some very interesting titles including outstanding arcade conversions and some quality original games. Why more of these titles weren't released for the Tutor is up for debate but at least in the case of the six original cartridges, they would have required reprogramming to run correctly on any hardware other than the original Pyuuta. This is because all hardware that would follow the original model Tomy Pyuuta, including the Tutor, Pyuuta Jr., and Pyuuta Mk.II, removed the katakana character set from the system firmware. Although the games still operate fine this causes text to appear as a garbled mess. Out of the six original cartridges only Scramble was reprogrammed to display correct text on the Tomy Tutor, more than likely and attempt to ride on the success of the arcade original. For the other five launch titles we'll have to contend with a little gibberish on the screen here and there. There are a lot of games to cover so let's start at the top with Bombman, possibly the first cartridge developed for the Pyuuta. Before we begin proper I want to give a huge thanks to those who have been acquiring, archiving and adding these Pyuuta cartridges to fill out the entire Tutor / Pyuuta library in MESS (Multi Emulator Super System), particularly Team Europe. It is due to the efforts of these hobbyists that we are able to enjoy these games and ensure the Pyuuta's place in video game history is preserved. Thank you! In a scenario that sounds like it has to do with a psychotic next-door neighbor, a madman is tossing bombs over a fence and only you, as Bombman, can put them out. Stop the bomber? Call the police? Nah, this is a video game, just keep putting the bombs out. Equipped with a special backpack-mounted water tank and handheld water cannon, it is your job to extinguish the burning fuses before the bombs explode. If that wasn't bad enough, a fire sprite is on the loose, dropping even more bombs all over the lawn. The fire sprite can be dispatched easily enough with a blast from your water cannon so smother him out as soon as possible. Pay attention though as Bombman's water tank has limited capacity and eventually empties, leaving his once mighty water cannon to merely trickle. All is not lost however as the water tank can be replenished, albeit slowly, at a nearby water tower. Touching a bomb, either lit or airborne, will cause it to explode in a screen-filling fiery blaze. Touching the fire sprite will do the same. Surprisingly if a lit fuse burns down the bomb does not explode. Rather it first shrinks and swells as a warning, giving Bombman one last chance to extinguish it with the water cannon. If the bomb is not extinguished it bursts into a little bomb sprite, causing all other action on the screen to stop. Bombman shrinks down to the same size as the little bomb sprite, possibly to allow easier maneuvering, and the water cannon becomes inoperable. Now the chase is on as Bombman is on the defensive. If the little bomb sprite catches Bombman it will explode, taking our hero with it. If Bombman can evade the little fire sprite for a few moments it will snuff itself out and play will resume as normal. 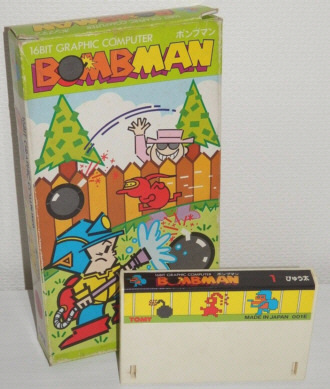 Although I have seen "Bombman" listed as the name of the bomber rather than the player character, it clearly seems Tomy was going for a Dig Dug motif with this game. For that reason I refer to the player character as "Bombman" as it seems more appropriate. 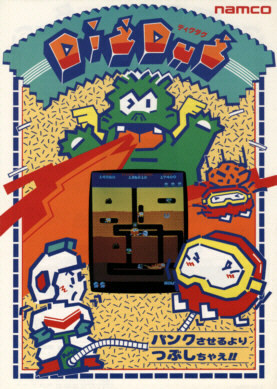 Both Bombman and Dig Dug were released in 1982, but the Bombman box art is a clear clone of the style of the official Namco Dig Dug cabinet and flyer artwork. Even Bombman's pose is directly lifted from Dig Dug and look at the illustration of the fire sprite - red and wearing a yellow swim mask just like Dig Dug's Pooka. The only thing that doesn't seem to fit the visual style of the box art is the bomber himself! There are also similarities to Activision's 1981 Atari Video Computer System game "Kaboom!" In fact if you were to give a reasonably vague description of Kaboom! to someone who had never seen or played the game, told them something like, "Make me a game where a mad bomber throws bombs down from the top of the screen. The player's objective is to extinguish the bombs before they explode, however the bomber himself cannot be reached or stopped and progressively throws more bombs at a faster rate," they may come up with Bombman. Origins aside, the sheer amount of stuff going on at all times in Bombman makes it not only a solid Pyuuta game but a solid single screen contemporary game of its time. Although the game takes place on the same single screen it does progressively become more difficult and complex with a faster moving bomber who throws bombs at higher speeds, more bombs on screen at once, more frequent appearances by the fire sprite as well as the fire sprite moving faster and an increase in his bomb dropping frequency. Fuses start to burn faster as well. Thankfully the speed in which the water tower refills Bombman's water tank also increases. As with Kaboom!, the over all speed increase will eventually wear out even the most experienced player. As the gameplay becomes extremely hectic, misjudgments and mistakes are easier to make, the biggest of which is running out of water at a critical moment. Refilling the water tank is accomplished by touching the spout on its top to the valve at the base of the water tower. A swell of water will visually move down the pipe to the tank to indicate that a refill is in progress. Once the tank is full the swells quit moving down - a really nice visual touch. Bombman can leave the water tower at any time and a "splash and go" strategy, as well as always stopping at the water tower when in the vicinity, become critical to keeping the water cannon functional. When the water tank is empty the water cannon will only spray for a quick second and is completely ineffective against bombs and fire sprites. Bombman moves rather smoothly in eight directions, as the game is presented in a 3/4 perspective, with good control response. Holding a direction will allow Bombman to move continuously. This is very a smooth motion, lacking the jerky response of some other Pyuuta / Tutor games. There is a very slight delay when turning around but this is actually helpful as it allows Bombman to face in the opposite direction without stepping forward. The turning delay is very useful in a tight situation as it allows precise control, I suppose it takes Bombman a moment to turn around because the water cannon is so heavy. Bombman can only face left or right and the water cannon can only be sprayed in the direction Bombman is facing. Either the SL or SR button activate the water cannon and holding the button down will trigger a continuous blast, but Bombman cannot move while firing. The slight maneuvering delay is lifted when a little bomb sprite "hatches" out of a bomb as the water cannon is no longer in use. I find this a very fair change in how the game plays, as in this mode it allows Bombman to move as fast as the little bomb sprites. Additionally while being pursued by a little bomb sprite, any bombs on the playfield can be passed through without incident, allowing the player to concentrate on evasion. The collision detection throughout this game is outstanding. Only collisions with bombs themselves set them off so Bombman can move around and get into position just where he needs to be. Touching a burning fuse will not set a bomb off, which makes perfect sense. It's really great to see accurate sized hit detection areas in a Pyuuta game as early as this one. If Bombman gets hit by a fire sprite or little bomb sprite and explodes, it absolutely made contact. Never once did I unfairly or unexpectedly come into contact with an object while playing this game. Collision detection is such a big sticking point with me but this game surpassed my expectations. That really should be stressed, everything in this game moves very smoothly and this is especially impressive since so much is going on. Once things start to speed up this doesn't change. Exceptionally impressive are how smoothly bombs move through the air, doubly so when the game speed increases. Not all bombs the bomber throws come to rest on the lawn, some drift off screen but still must be avoided while airborne. Even with with all those objects on screen, everything continues to move smoothly and correctly. The single background and playfield are nicely drawn with good colors and a believable perspective. For such an early Pyuuta game Bombman has an audio package that puts many other games on the platform to shame. This isn't immediately apparent, as nothing really stands out but that's the whole reason the audio is so good. Everything works incredibly well together and nearly everything in the game has a unique sound. The bomber's feet make a step sound when walking back and forth and he makes a different sound when peeking over the fence to the left and right. Bombman has a unique walking sound and his water cannon also has its own sound. The fire sprite has a running sound as it moves about and the little bomb sprites have have a distinctly different sound as they move. The fuses on bombs make a hissing sound as they burn down. As additional lit bombs land on the lawn they also make hissing sounds, adding extra layers of audio as well as increased volume. Additionally bombs that have had their fuses burned down make a ticking sound in time with their shrinking and swelling, giving notice that they are about to blow. 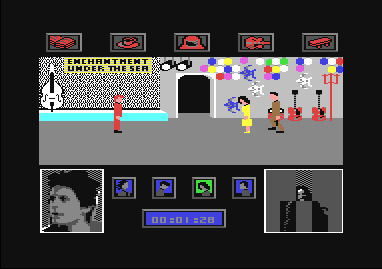 Each player life is introduced by a siren, growing in intensity, until Bombman walks onto the screen. It's as if Bombman is driving up to the playfield from off screen. The usual Tutor / Pyuuta "success" tone is used when putting out a bomb or dispatching a sprite but the explosion sound packs a punch without being terribly grating. This also was surprising as the explosion sound is appropriate yet not harsh like so many other similar event sounds in other Tutor / Pyuuta games. 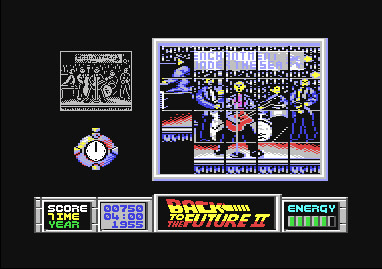 As for music, Bombman has a unique theme tune that loops on the title screen that is reasonably pleasant as it stops once the game begins. When it's game over a rendition of "Shave and a Haircut" is played, a fitting end tune for the Pyuuta's first game. An immense emphasis must be placed on all the little details in this game. As with the audio package, while nothing really stands out beyond anything else, the overall care in which the game comes together is remarkable -- especially for the first game in the release catalog. All characters and objects are well drawn, are easy to see, easy to distinguish, and have good animation. Bombs have different size sprites depending on if they are being thrown or are descending and move in predictable arcs. Burning fuses burn away with a two-frame flicker animation and Bombman himself has a nice little walk animation. The bomber's feet move independently, he stands on tiptoes to peek over the fence, looks left and right and ducks down. The fire sprite and little bomb sprites have some personality and as has been mentioned, water moves down the water tower pipe into Bombman's water tank during refill. The life ending explosion fills from the center of the screen and is a cool effect. There's even a real title screen with "BOMBMAN" displayed in large letters over the playfield while the bomber peeks over the fence. However my favorite detail of this game is how it goes an extra step to minimize player frustration by providing subtle indicators concerning alignment of the water cannon. When the spray of the water cannon is making proper contact with a bomb or fire sprite, the water blast will be blue. However if Bombman is not at the proper distance and elevation relevant to an object to be extinguished, the spray from the water cannon will be white. Additionally fire sprites are blue when active but turn red when trapped under the water blast as they are extinguished. Although it admittedly looks like a considerably simple game with a very simple concept, the overall care and attention to detail given to Bombman make it a great single-screen high score driven game. Sure it doesn't look all that impressive next to Jungler or Traffic Jam but it plays well, has an interesting concept, and is well programmed. Add in a second difficulty setting where the bomb fuses burn faster from the start and you have a reasonably addictive starter game for the platform. While it won't set anyone's world on fire, it was a worthy game to introduce the Pyuuta to the Japanese market. Perhaps the simple graphics, lack of a recognizable name on the box or the required text reprogramming kept this game in Japan only. For whatever reason that may have been, Tutor owners missed out on a cool little game. When I was first kicking around the idea about attempting to get a newsletter such as this going again, the question came up if a simple text newsletter such as this has any place online in the modern day and age. I suppose it's a valid query especially considering how decidedly unmodern I wanted the whole thing to look. To me, it's about legacy. It goes back to when Retrogaming Times Monthly was launched in the wake of the original Retrogaming Times going on hiatus. Tom Zjaba's original newsletter was always a constant to me during its publication days and I always found something interesting, entertaining or enjoyable in that text. Retrogaming Times Monthly was founded to continue on, as much of the staff still had opinions, stories, thoughts and memories to put to words. December of 2004 is when I decided to join in on the fun and began writing about arcade to NES conversions, beginning with the Tengen label. I will admit, some of those early articles of mine were pretty laughable (some would say my articles still are) but that didn't matter - I was having fun, playing video games, and putting those experiences down into words that I would be able to look back upon. It was also in those issues that I learned about games and hardware from other contributors that I would have never been exposed to otherwise. That so many issues were published with so little overlap in content shows that there was, and still is, a lot to say. Dozens upon dozens of writers, hundreds of issues, thousands of articles and still so much variety. That is the true legacy that brings us to this point. As long as someone has something to say about retrogaming - those personal experiences, stories, opinions, thoughts, memories, ideas, knowledge - I will happily publish them as part of The Retrogaming Times. There is still so much more to say and I look forward to you joining in! Thank you once again for checking out The Retrogaming Times. We'll be back on May 1st with our next issue. Be sure to follow The Retrogaming Times on Facebook and join our new community! I sincerely hope you enjoyed this first issue and that you will return to read the next issue and possibly submit an article yourself. Remember, this newsletter can only exist with your help. Simply send your articles directly to me at trt@classicplastic.net or check out the submission guidelines on the main page. Submit an article today and join a great retrogaming tradition!